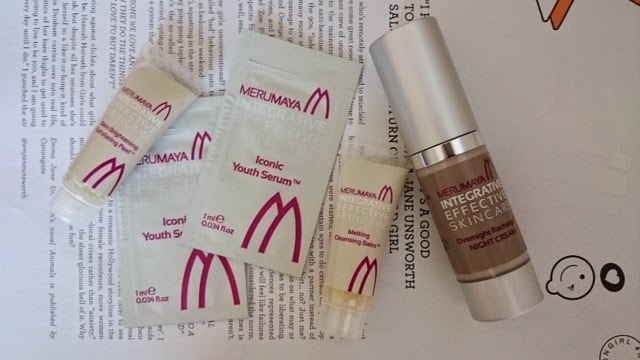 A few weeks ago I attended a bloggers meet up where I was introduced to the amazing brand Merumaya*. Up until that day I have never heard of this brand previously. All the products from this range is to "prevent & perfect skin ageing; deliver high performance at a fair price; add pleasure and practicality". We each received a one to one consultation with the lovely Lekha who took time to talk through what we are currently using and what / if any concerns we had with our skin. Once the analysis was done she started recommending various products for me to try. My skin is usually dry / dehydrated and I came out with the Iconic Serum, face peel, cleansing balm and night cream. I am not one to review products I don't generally enjoy and see results with (I stick to what works) and I have to say I am very surprised with the results of these products having only used it for just over 1 week. It is moisturising / hydrating which is what I need and it makes my face feel very pumped which is essential at my age!!! I am a Lancome lover and have been using it for over 10 years. It is expensive so I have tried to move away at least 3 times and each time I end up going back because nothing is as moisturising. However once I finish up my current pots I will be purchasing the full Merumaya set! What's great about Merumaya is the price is very affordable, I have added the links to the products just click on the item you want to find out more about. (Each of the pics below does show a different product even though the packaging looks the same!) Click on the products below and it will take you through to the site and it will provide you with more info. The packaging is simple nothing fancy but if it works who cares! See if you can get some samples to test out if you are not sure about purchasing full sized products! Let me know how you get on.